Designing Wind Resistant Complex Facades and Rooftop Equipment - Zero/Six Consulting, LLC. For structural performance, ASTM E330 is used for windows, doors, skylights, and curtain walls. This uniform static air pressure difference structural testing, in addition to ASTM E1886 and E1996 impact and cyclic pressure testing, provides valuable data to ensure engineering analysis is correct and the units are performing as required. For metal wall and roof panels, ASTM E1592 can be used to test for structural performance. Roof membranes can be tested for uplift resistance using ASTM E907. The desire for hurricane level wind resistance has caused test standards to be created for the majority of architectural components and cladding. Other equipment and components that are subjected to wind loads on buildings do not currently have test standards to ensure these features perform as intended. At the rooftop this includes equipment such as HVAC and photovoltaic systems as well as duct or pipe chases that are installed across the roof. Walls, signage, light fixtures, and some architectural features like fins and sunshades, don’t have a standard for structural performance testing. Free standing signs also do not have a way to test structural performance, and creating a test standard for all of these different pieces of equipment and components would be difficult. The reason for this is that an engineer’s judgment comes into play when deciding what testing should be performed for those things of which they are unsure. These decisions may be minor such as movement or vibration, which can cause wear or damage over time. Although not evident at first glance, an engineer may find these unacceptable, so the standard would have to be adapted for the particular component and method of testing. 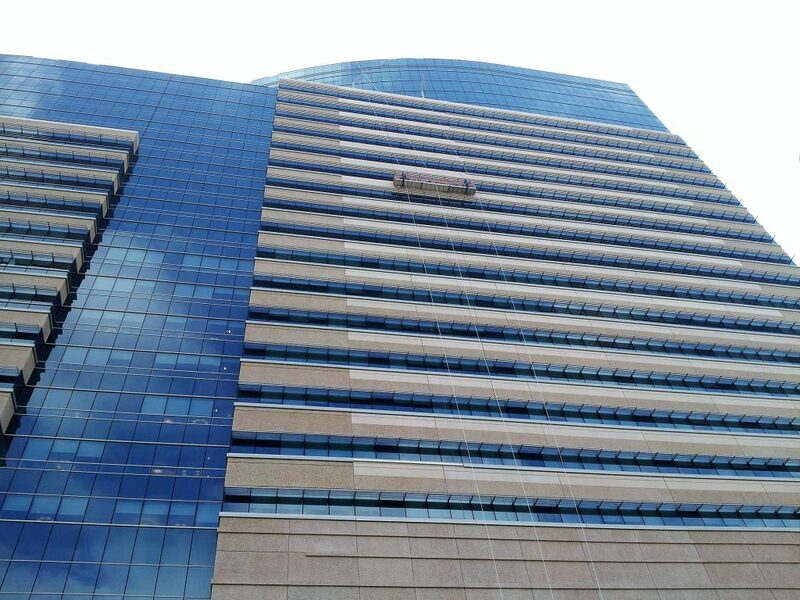 The reason a test standard would be helpful is that components, such as rooftop units (RTUs) or those attached to curtain wall systems, including fins and sunshades, are typically a delegated design, which have no structural test standard. What this means is that the structural engineer and architect pass the responsibility for ensuring these components meet wind loads to the designers of these components. RTUs are designed by mechanical engineers, where the most important factors are mechanical functions (as it should be). Typically these engineers do not take into consideration the high wind load potential on a roof. 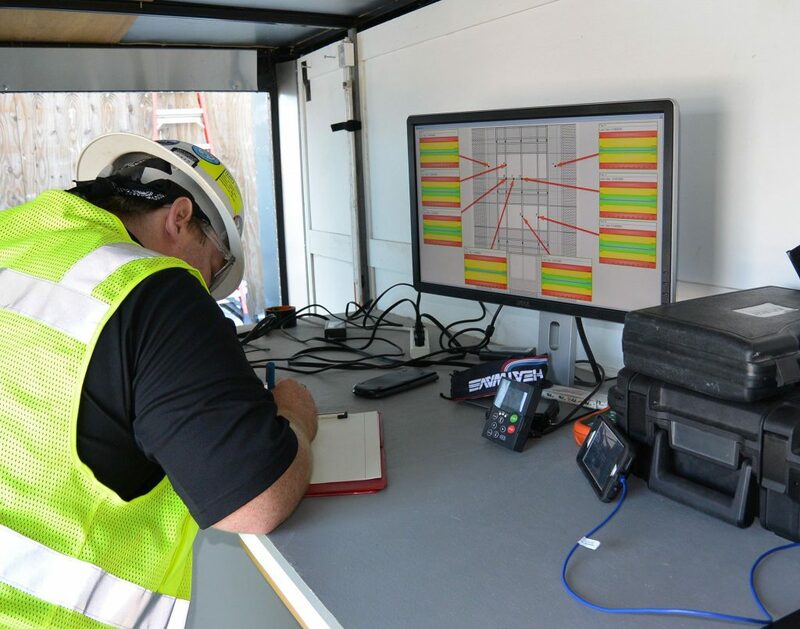 Roofing contractors will attach blocking and possibly attach the RTUs, but the wind resistance of the RTU itself is the responsibility of the manufacturer. Some types of RTUs may require additional mechanical anchors, such as cables or frames, to transfer the wind loads to the structure. 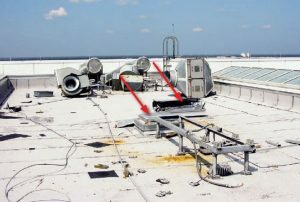 The International Building Code (IBC) and American Society of Civil Engineers (ASCE 7) have had significant changes in the recent editions to give increased attention to rooftop equipment, as many severe wind events have caused failures in this area. For rooftop equipment, IBC now requires the use of ASCE 7, and the 2010 edition of ASCE 7 now includes vertical uplift loads as well as the horizontal loads on RTUs. 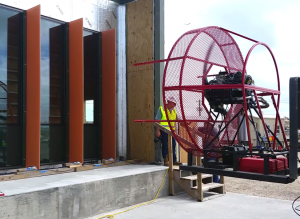 Physical testing currently on RTUs involves either model or full-scale wind tunnel tests. These give valuable information on structural performance of RTUs which can be used to design the components and attachment, as well as similar RTUs. 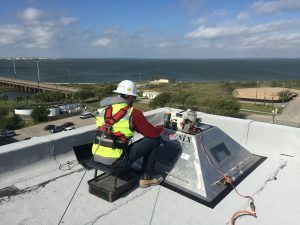 Other rooftop components, such as satellite dishes, antennas, and piping with supports, should also go through some form of testing to give backup for engineers to consider when designing mountings or attachments for these different components in high wind zones. provide aesthetics. Structural failures with these components can cause safety concerns for people on the streets and sidewalks below. 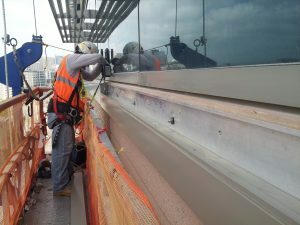 Although widely used, these components are typically unique to each project; therefore, little guidance is found in curtain wall literature or building codes. Manufacturers may provide load tables or general calculations, but it isn’t always clear to a designer what engineering has been done to back up that information. The wind loads acting on these flexible and lightweight shades and fins are difficult to estimate or even measure with a traditional pressure tap in a wind tunnel test. More recent studies have used hot-wire anemometry to perform wind tunnel tests and provide a better estimate on the attachment loads that are away from the building. Finally, testing on heavy components, such as glass features, is helpful to ensure the engineers understand how the fin behaves with high wind loads. During testing, vibration and permanent deformation may help the engineer refine the design of attachment components to prevent failures in the field. Aside from high wind loads caused by building height, many high wind loads observed on these architectural features are due to their proximity to the coast. In this location, designers will also observe more intense and frequent rain events as well as sea spray causing corrosion from the salt in the air. Corrosion resistance is important to assure attachment strength and prevent failures over time. 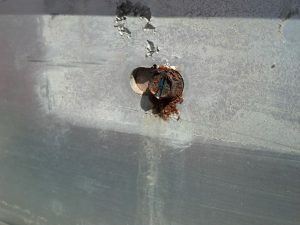 Note that using 304 or 316 grade stainless steel fasteners are required by some code revisions in coastal areas. Another design issue is thermal expansion and contraction of metals on these exterior features. Rigid attachment over long spans will end up shearing screws away when the temperature swings. Slotted holes and plastic washers can be used to provide relief from the internal stresses that build up from thermal expansion and contraction on fasteners. Good workmanship is needed to attach these “miscellaneous” building elements. In addition, anchors must be centered on slotted holes to perform properly, and tightening nuts with a torque wrench is usually necessary to achieve a precise tightness. Signage and lighting are also exterior building components that are difficult to estimate wind loads and do not have a standard test for wind resistance. Signage often fails in a major windstorm and the components can become dangerous projectiles. Exterior lighting attached to the building isn’t called out directly in the scope within ASCE 7 Chapter 29 for wind loads on building appurtenances, but it is assumed the solid attached signs method can be used to estimate wind loads on these components. Although attachments can be engineered, the light itself must be able to withstand higher wind loads, which is typically handled by the manufacturer. Developing a test standard that could be used on such a wide range of building components would be difficult, but having actual test data for different types of sunshades, fins, and RTUs for engineers to reference and use in their design of similar components would be helpful. In many cases, such as custom signage, identical configurations could be used worldwide near coasts or high winds, and would be worth having a tested assembly. The test standard would likely require different parts for different types of these miscellaneous building components, and would most likely have different types of apparatus to apply the loading. For architectural testing companies, equipment such as wind generators, deflection gauges, load cells, mock-up walls and roofs are used regularly; however, since standards do not exist for these components, engineers typically have to come up with an improvised test to see how their building components perform.